Tazza; silver-gilt; embossed and chased; Faith in landscape; border of strapwork scrolls etc; inscribed. ; knop chased in relief with festoons, lion masks, etc; inscribed. ; foot similar to border; bottom of foot with convex plate engraved with arms of Count von Thun of Bavaria; inscribed. Commentary of this tazza: The woodcut by Jost Amman, reproduced in the ‘Kunstbüchlein’, published posthumously in Frankfurt in 1599, has been identified as the source (see Weber 1970, p. 341, fig. 17). However, the inelegant figure in Jost Amman's woodcut has been dramatically transformed in this version by Hübner. He used as his source the same woodcut when making both the 1590 Faith tazza and the 1594 Faith tazza (both in the Palazzo Pitti, Florence) and in each Hübner has introduced a number of changes (see Weber 1970, pp. 340-6, figs 14-17). In the 1590 Faith tazza, the figure holds the chalice by the foot (as in the woodcut), and though the head is in profile facing left (as in the woodcut) the figure has a Mannerist contrapposto (not present in the woodcut); finally, the little wayside chapel with kneeling figure is on the right of the landscape (as in the Waddesdon Bequest tazza). The landscape is, however, not the same in any of the three tazze, and Jost Amman's woodcut had no landscape. In the 1594 Faith tazza, the little wayside chapel has been transformed into a large church but without any human figures; the figure of Faith holds the chalice by the knop, and in general character it is close to the Waddesdon Bequest chalice. Again, the head of Faith is seen in profile looking to the left and, as in the 1590 version, her robe is properly discreet, covering both breasts. The arrangement of the tombstones in both the 1590 and the 1594 tazze is essentially the same, but greatly differs from the solution devised by Hübner on the tazza in the Waddesdon Bequest. This inconclusive evidence seems to indicate that when Hübner made the Waddesdon Bequest tazza, the 1590 version had not been forgotten. 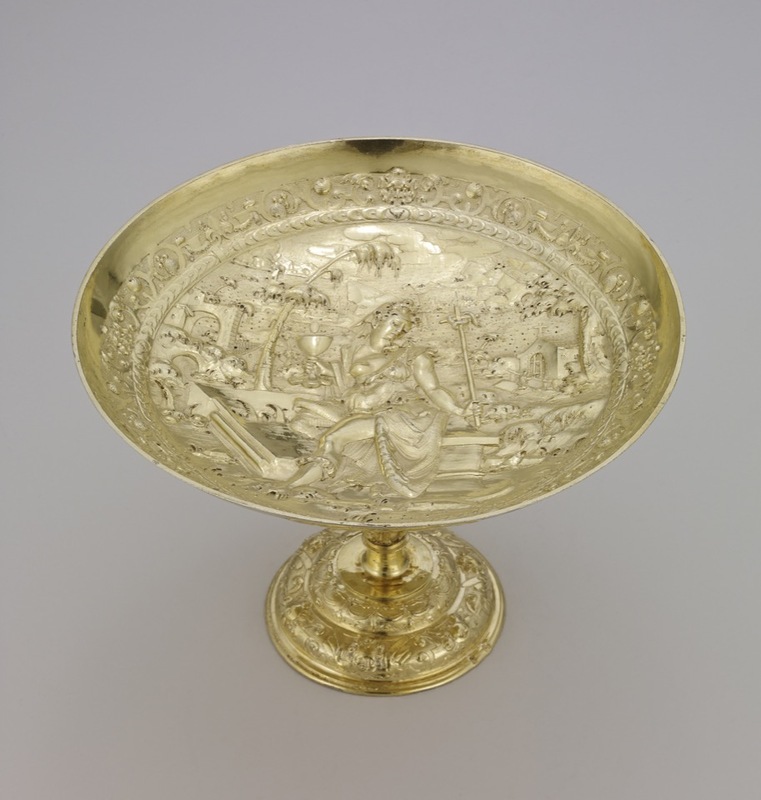 It is, however, unlikely that an artist would progress from the 1590 to the 1594 solution via the very sophisticated solution of the Waddesdon Bequest tazza. It would seem that, even if the known wishes and preferred tastes of the patron dictated some of the characteristics of the figure-style, Paul Hübner developed swiftly towards a most accomplished solution in the Waddesdon Bequest tazza, although it must be acknowledged that in the 1594 version he has given the figure of Faith a greater monumentality and dignity.